I have great pleasure in presenting Professor Carlos Eduardo Morelli Tucci of Feevale University in Novo Hamburgo, Brazil, as this yearâ€™s recipient of the International Hydrology Prize. Professor Tucci has had an outstanding career as a researcher in many fields of hydrology, as a teacher and a consultant. Professor Tucci received his first degree in civil engineering in 1971 and his MSc in civil engineering / water resources in 1975 from the Federal University of Rio Grande do Sul, Brazil; he received his PhD in water resources engineering from Colorado State University, USA in 1978. Professor Tucci was full professor of the Hydromechanics and Hydrology Department of the Institute of Hydraulic Research (IPH) of the Federal University of Rio Grande do Sul (UFRGS) from 1972-2003 where he was Coordinator of Research activities in Urban Water Management and Modeling in Water Resources and Head of the Graduate Program on Water Resources from 1993-1997. He retired as civil servant in September of 2003, acting as invited professor since then. Since 2009 he has been Professor at Feevale University in Novo Hamburgo. His main areas of scientific interest have included Hydrology and Hydraulics, Simulation of water resources systems, Urban water management, Water resources management, Climate variability and flow forecasting and Integrated Environment assessment. He teaches the disciplines of Basic Hydrology, Engineering Hydrology, Hydrologic Simulation, Computational Hydraulics at the graduate level and Applied Hydrology and Stormwater management at the undergraduate level; he is adviser of Master thesis and PhD dissertations in the Water Resource graduate program of IPH/UFRGS and Feevale. Professor Tucci has held many important positions during his career including Secretary of the Water Resource Investment Fund of the Ministry of Science and Education of Brazil, 2001-2003; President of the Brazilian Water Resource Association, 2003-2005; President of South America Technical Advisory Committee of the Global Water Partnership 2003-2005; Researcher supported by the National Research Council of Brazil, 1980-2010 and senior researcher since then; President of UNDP Capnet Brazil, 2007 until present; Vice-chairman and member of the board of the UNESCO International Centre for Water Hazard and Risk Management, Japan 2006-2008 and member of the board 2008-2010; Main editor of the Brazilian Water Resource Journal; Editor of Revista de GestÃ£o da ÃÂgua da AmÃ©rica Latina â€“ Water Management Journal; Chairman of the Latin American Seminar on Water Resource Public Policies in Brasilia, 2004; Member of the scientific board of several national and international journals; Fellow of the International Water Resources Association; Research advisor and project evaluator of State and Federal Research Agencies in Brazil, Uruguay and Argentina; Member of the scientific board of Urban Waters Journal (England) and of Revista Latino Americana de Recursos Naturales (MÃ©xico). Professor Tucci has received many honours including: the Medal of Civil Defense of the State of Rio Grande do Sul in 1985; Best book on Science and Technology in 1994 in the Book Editor Society of Rio Grande do Sul for â€œHydrology Science and Applicationâ€Â; the Bi-annual award of the Brazilian Water Resource Association, 2005; the Best Paper on contribution of application of meteorology given by the National Institute of Meteorology in 2006. He has an impressive publication record including 22 books, 65 chapters in books, more than 130 papers in international and national journals and more than 240 papers in symposia, seminars and reports. Professor Tucci has served IAHS well as Vice-President, 1999-2003 and as President of the Local Committee for the Scientific Assembly of IAHS in 2005 in Brazil. He has also been a consultant on a broad range of topics world-wide for many international organizations including UNDP, UNESCO, WMO and the World Bank. 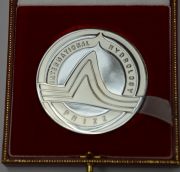 In the thirty years since the International Hydrology Prize was first presented this is the first time that it has been awarded to a recipient from Latin America. Professor Tucci brings distinction to his country, his region and the global hydrological community. It is a privilege to award him the Prize in behalf of our Association. In a Sunday of May, Pierre Hubert called me from Paris and at first I though he was inviting me to participate in a Prize committee. 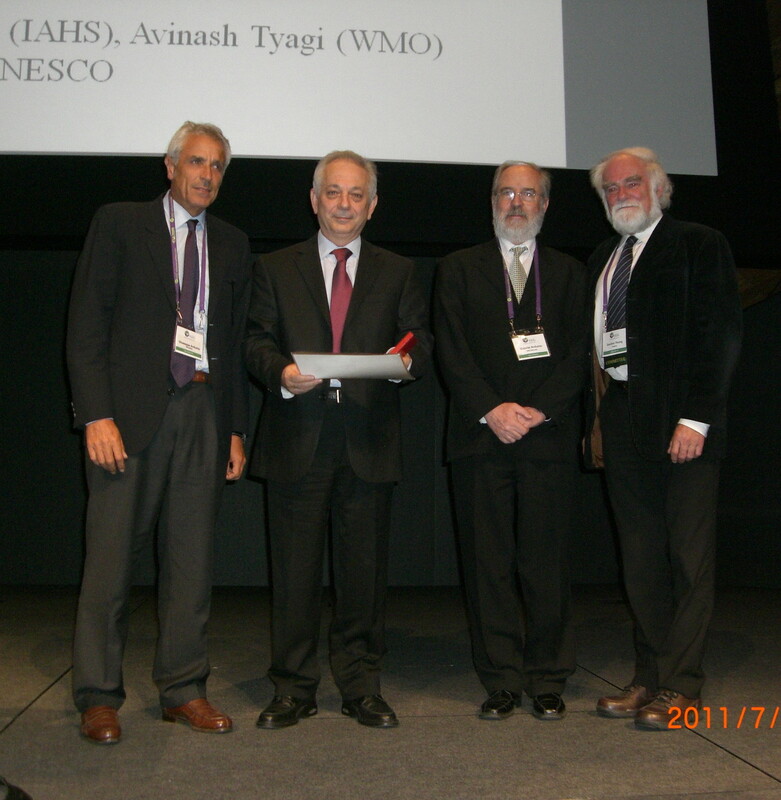 He had to insist that I had received the important International Hydrology Prize of IAHS. I did not know I was to receive the Prize. It was an honor to receive this Prize since I am the first Latin American Researcher working outside of main stream countries in hydrology science to receive this Prize. I believe it is the result of the Brazilian investment in science since the 80Â´s with billions of dollars in scholarship and supporting research. I believe it is also the result of the working in the Institute of Hydraulic Research a 48 years old institution with its 43 years of interdisciplinary graduate program which was created by an UNESCO project in the sixties to qualify professors and students from everywhere in Latin America. I am sure it is also the result of the education of my father and mother, the family I have of which I am very proud of and mainly my wifeâ€™s support which took most of her time, beside her work, in raising the children and her understanding of my frequent absence from home. I am very grateful to have the opportunity to work in a period of time of many changes in a country with so many challenges to deal with, starting with the inflation chaos of the 80Â´s to nowadays when 20 million people come from poverty to the middle class. In this environment we have many challenges of knowledge development which have direct use for society in some unique eco-hydrology environments such as Pantanal, Amazonas, Savanah of Central Brazil, semiarid and nine thousand km of coastal areas. The richness of that, in a continental country strengthened our belief that natural sciences such as hydrology, require development of local and regional knowledge related to complex interactions of natural behavior in different scales of time and space with human economic and social complexities such as deforestation, urbanization, air and water contamination. There are not turn key tools but each environment has its own Hydrology DNA to be understood and adapted in order to have a sustainable society. In 2001 I had the opportunity to develop a strategic framework for research in water resources for Brazil and today I am reviewing this strategy after 10 years and the key lines of research have been based mainly on the development of science and technology with real visibility for society and discussed with private and public decision makers. It has been an important opportunity to understand how dependent is the modern society on hydrology knowledge, which supports environment, water supply, food and energy production and extreme events, among others. In the next 40 years the world challenge will be the additional 3 billion persons in cities of developing and poor countries with local high demand for natural resources. Hydrology plays an important role in the urbanization for support solutions. In these countries, there is a big gap of knowledge in Hydrology which leads to vulnerable societies. Because of that, It is important that the efforts start in developing capacity building in order that these countries develop their own solutions, outside of the common procedure of supply driven projects which usually leave more economic debts than benefits. I believe institutions such as IAHS have the opportunity to support these issues by its networks of researchers, professional and research centers, taking account of global existing economic resources. I thank IAHS for this Prize and the opportunity to present this response.